Flared mouth, arched belly, slightly splayed long loop leg. The outer surface and the leg of the bowl are fully glazed in ruby red, and the inside surface is applied with white glaze and decorated with veiled patterns of cloud and dragons. There's a four-character veiled date mark "Yongle Nian Zhi"( Yongle Period") engraved in seal script in the middle of the inside bottom. Gracefully shaped and evenly applied with flawless bright red glaze, the bowl is a rare treasure. 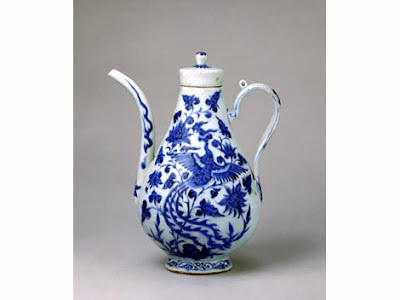 In the Yuan Dynasty, Jingdezhen already had the ability to mass-produce fine blue and white porcelain. Then during the Ming and Qing dynasties, many new types of wares were created. High quality porcelain with elegant shapes made Jingdezhen known as "the Capital of Porcelain". 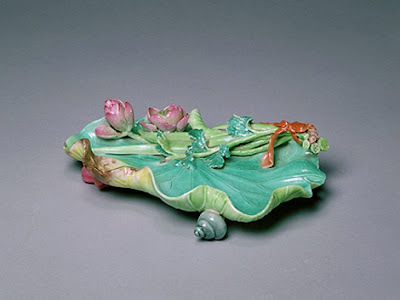 Ceramics-manufacturing crafts reached its zenith in the Ming and Qing dynasties. Tremendous varieties of vessel shapes, lustrous glaze colors and wonderful decoration designs of that period were conformative evidence. Famous brands included white Dehua wares from Fujian Province, Yixing Zisha (boccaro) wares from Jiangsu Province, and white Zhangzhou wares from Fujian Province. In the north, two important mass-produced wares were Fahua pottery from Shaanxi Province and Cizhou Kiln porcelain from Hebei Province. Straight mouth, increasingly wider from the mouth down, thick neck, sagging belly, tapering off down sloping down from the lower belly, slightly splayed loop leg. There's a long curved spout that is thin on top and thick at the bottom on one side of the belly, and a ruyi-shaped handle with a small knob on top on the opposite side. The cover is flat-toped and has a knob shaped like a round bead. The bottom of the pot is white-glazed, bearing no date mark. The spout is decorated with flames and cloud, and the handle is decorated with such patterns as silver ingots and precious hairpins etc. And the cover is painted with chrysanthemum petal patterns. The body of the jar is decorated with blue and white patterns all over against the misty blue glaze background, with the patterns of phoenixes amid intertwining flowers painted on both sides of the belly and interspersed with fireball-shaped cloud and bamboos and rocks. The patterns on this pot are densely arranged, with the main-theme patterns standing out from all others. The arrangement is elaborate but not messy. The blue and white glaze penetrated deep into the base, bringing bright colors to the work. The pot is a rare work of pure colors of all blue-and-white porcelain articles handed down from the Yuan Dynasty. 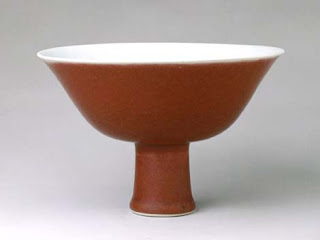 Straight mouth, short neck, sloping shoulders, bulgy belly, loop leg, and unglazed sand bottom; The porcelain is thin on top and thick at the bottom and is fine in texture. The blue-and-white patterns are brightly colored, and the underglaze is slightly dark red. There's a cover with a lion-shaped knob on top of the jar. The cover is stack-carved with a sitting lion-shaped knob on top, with three lines of blue-and-white lotus petals, curling grass, and labyrinth patterns around the surface below the knob. The body and the mouth edge of the jar are ringed with blue-and-white intertwining floral patterns and curling grass patterns respectively. The shoulders are decorated with hanging-down ruyi-shaped cloud patterns, in which blue-and-white lotus flowers on water waves are featured. 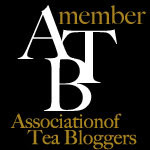 There are intertwining peony patterns between every two cloud patterns. The belly is stack-carved with petal-edged paneled decorations in the shape of a diamond on four sides, with open-carved mountain rocks, peonies and other garden scenes of the four seasons inside the paneled decorations. The mountain rocks and flowers are applied with underglaze red, and the leaves are applied with blue and white. The patterns are created with a relief sculpture feel. The lower belly is decorated with blue-and-white intertwining lotus patterns in corresponding places with the cloud patterns on the shoulders. The area below the belly is adorned with curling grass patterns and variant lotus petal patterns, with downward-facing treasure flowers inside the lotus petal patterns. The jar is full-bodied and adorned with patterns in clear layers. The making of this jar involves various techniques like painting, open-carving, sculpturing and sticking etc. The blue-and-white color and the red underglaze contrast nicely with each other, shining with the luster of red and blue. Small mouth, short neck, broad shoulders, loop leg, increasingly wider from the shoulders to the belly, and tapering off from the belly down. 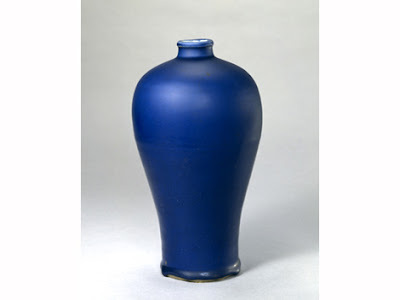 The vase is fully applied with cobalt blue glaze in high temperature, with the area close to the bottom appearing purplish black due to thick accumulation of glaze. The inside of the loop leg is left unglazed. The vase is simple and elegant in shape, covered with thick, even and sober glaze. 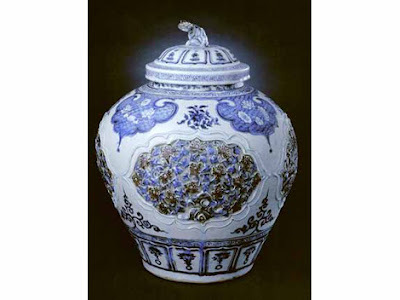 The shiny vase is a masterpiece of cobalt blue-glazed porcelain ware of Jiajing Period in the Ming Dynasty. Wide mouth, flared edge, gradually contracted from the edge to the slightly full belly, loop leg. 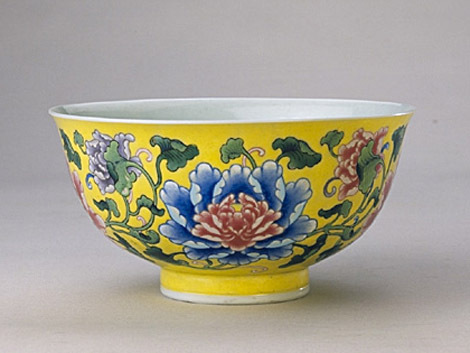 The inside of the bowl is unadorned and the outside is applied with yellow as a background, against which blooming peonies, intertwining leaves and branches are pained in a riot of colors—red, blue, green, pink and pale pinkish purple etc. The bottom bears the date mark of four regular-script characters "Kangxi Yuzhi" (commissioned by Emperor Kangxi) in two lines inside a blue square. The bowl, characterized by its elegant shape, rigorous painting, bright colors and superb craftsmanship, is a masterpiece of porcelain ware with enamel decoration in Kangxi Period. Dish-like mouth, long and thin neck, long and round belly, splayed out from the belly down, loop leg. The vase is painted with peonies in a palette of colors—pink, tangerine, jadeite green, grass green and brown. The outside bottom bears the six-character blue date mark "Daqing Yongzheng Nian Zhi" (Yongzheng Period, the Great Qing Dynasty) in regular script in two lines. 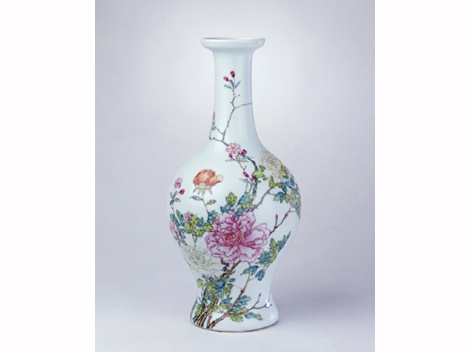 The vase is in perfect proportion, with smooth couture lines, well-arranged painting, sober colors and elaborate depicting of each and every petal and leaf, giving a lifelike feel. The vase is nothing short of a masterpiece of famille rose porcelain ware of Yongzheng Period. The plate is shaped like a lotus leaf, which is partly folded and the stalk is twisted onto the leaf through branches from the reverse side. The edge of the leaf is stuck with lotus flowers in bud and seedpods with movable seeds. And there are legs shaped like river snails and water chestnuts stuck to the bottom, which bears the four-character blue date mark "Qianlong Nian Zhi" (Qianlong Period) in seal script. What's known as "citron plate" is a small fruit tray placed in an ancient study for holding yellow citrons or fingered citrons, and the sweet smell of the fruit adds a lot of elegant taste to the study. This citron plate is exactly modeled after real items in the nature world in terms of its shape and glaze colors. The plate with lifelike colors and texture fully reflects the high skills of porcelain shaping and firing in the Qing Dynasty.